The Rainbow River is located in Dunnellon, Florida, which is in the southwest corner of Marion County Florida, about 20 miles southwest of Ocala, 100 miles northwest of Orlando and 100 miles north of the Tampa Bay area. The Rainbow River is formed by a first magnitude spring (Rainbow Springs) that is ranked fourth in the state for volume of discharge. In addition to the springs located at the headwaters, there are many smaller springs that discharge from numerous caves, rock crevices, and sand boils the entire length of the river. The Rainbow River is a gently winding river that is 5.7 miles long and merges with the Withlacoochee River at Dunnellon Florida. On average, the Rainbow River is less than 10 feet deep. There are a few places where the depth is about 25 feet, yet just a few feet away it is shallow enough to stand. The headwaters, Rainbow Springs, is the anchor for the Rainbow Springs State Park. This first magnitude spring is not one large vent but is numerous vents that issue 400 - 600 million gallons of crystalline water every day. The Rainbow Springs State Park is a popular destination to swim, snorkel, canoe, picnic, or stroll on the walking paths to enjoy the many plants and animals that abound here. Once named Wekiwa Creek, Blue Spring, and Blue Run, archaeological evidence indicates that the waters of The Rainbow River have attracted and sustained human inhabitants for over 10,000 years. The crystal clear water, abundant with fish, wildlife and vegetation along with the constant water temperature of 73 degrees, has attracted a number of modern day activities. The Rainbow Springs and The Rainbow River became popular in the late 1880s when hard rock phosphate was discovered in the area. A small community called Juliette flourished near the springs during this "boomtown" era. In the 1930s the spring was developed as a tourist attraction. Sea walls, a lodge, gift shop, the waterfalls, and a reptile exhibit were developed. Under new ownership, the real heyday for the attraction occurred in the 1960s. During that time activity greatly increased with glass-bottomed boat rides, riverboat rides, log raft rides, a gift shop and cafe, an aviary, a leaf-shaped gondola/monorail system, a horse rodeo, and submarine boat tours. Not faring well when traffic began using I-75 instead of U.S. Highway 41, with many tourists heading to a new attraction called Disney World, the attraction closed in 1974. The Rainbow River was designated as a Registered Natural Landmark in 1972, an Aquatic Preserve in 1986, and an "Outstanding Florida Waterway" in 1987. The state purchased the original area that was the Rainbow Springs Attraction in 1990. Volunteers cleared the overgrown park and opened the park on weekends to the public. The Florida Park Service officially opened Rainbow Springs State Park on a full time basis on March 9, 1995. Rainbow Springs State Park is comprised of 1,459.07 upland acres (which includes around 100 acres of wetlands) and 12.83 submerged acres. The most significant natural feature is the first magnitude headspring basin which produces between 400 - 600 million gallons of fresh water per day, forming The Rainbow River. The looking glass waters of Rainbow Springs come from several vents, not one large bubbling spring. The river itself supports a wide variety of fish , wildlife, and plants, many within easy viewing by visitors.In total, the park contains 11 distinct natural communities, including sandhills, flatwoods, upland mixed forests, and hydric hammocks. Visitors are able to see a variety of wildflowers in season; oak, longleaf pines, magnolia, dogwood, redbud, and hickory trees; gray squirrels, red-shoulder hawks, swallowtail kites, barred owls, whitetail deer, and a wide variety of wading birds. The relative peace and quiet of the winter season offers much for the nature enthusiast. There is an interpretive room located in the visitor center displaying historical, natural, and cultural resources of the park. Click here to get location information, rates, fees, etc. 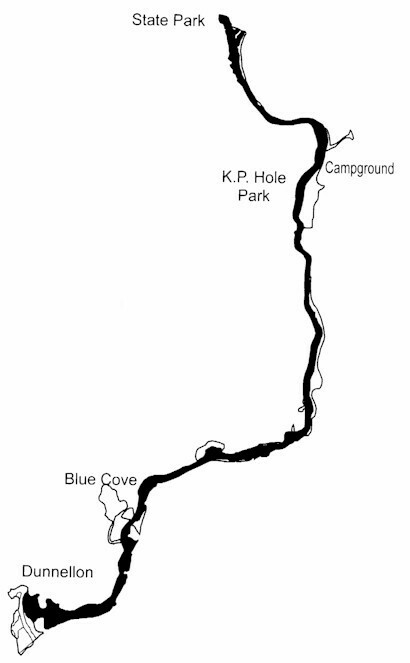 Click here to find out the basic rules on The Rainbow River. Click here to learn about some of the aquatic plants you will see on The Rainbow River. Click here to find out about Activities and Events on The Rainbow River. Click here to find links to local businesses. If you think that you would like your Rainbow River business linked to this site or if you would like to have reference made to your Rainbow River area business on this site, let us know by using the form on the Contact page. This site, TheRainbowRiver.com, is not associated with the State Park, Marion County or their facilities. If you have questions about the Park's activities, camping, canoeing, scuba diving, tubing, lodging, etc. you need to use the contact information on this site to contact the appropriate office or department. If you use the Contact button to ask me about these types of question, you most likely will not get a reply to your email. Contact information, such as phone numbers, are listed throughout the site for the services or activities referenced on the site. So, before you decide to send a request for information to me about services or activities, take the time to review the appropriate pages on the site and find the informaiton or the contact information for the specific business or department that provides that service or activity. In addition, if you are contacting us looking for referrals to local businesses, like lodging, restaurants, boat or tube rentals, or other local business information, we do not provide information for businesses that do not advertise or otherwise support this web site. Hence, if the information is not on this web site (check all the pages) it is not available via electronic mail.